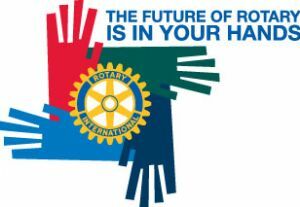 RI President-elect John Kenny unveiled the theme, The Future of Rotary Is in Your Hands, on Monday during the opening plenary session of the International Assembly , an annual training event in San Diego, California, USA, for incoming district governors. "The future of Rotary will not be shaped at RI headquarters -- it will be shaped in each and every Rotary club," Kenny said, "because it is for each of us -- as Rotarians -- to do what is necessary to keep Rotary strong." Kenny acknowledged the foundation established by past Rotary leaders and laid the responsibility for building upon that success on every Rotarian. "Each one of us is standing on the shoulders of generations of Rotarians past, and it is our responsibility to determine Rotary's future," Kenny said. "The goals we set, whatever our action plan, it is in our hands to accomplish or not," said Kazeem Mustapha, governor-elect of District 9125 (Nigeria). "Everybody has to be involved." Chuck Cicchella, governor-elect of District 6710 (Kentucky, USA), likes the theme's emphasis on the future. "I have always had a strong desire to nurture along young people. It's vital to us." Kenny emphasized that every Rotary club is and must be autonomous. "Everything begins and ends with our clubs," he said. "Our clubs can and do work together; they work through their own districts, in cooperation with other clubs and districts, and with the support of our Foundation. "But at the end of the day, everything that we accomplish is done through the strength of our clubs. And so each club must have autonomy to serve where and how it can serve best." At the same time, Kenny highlighted the importance of the RI Strategic Plan , adopted by the RI Board of Directors, as an essential tool in providing continuity. "The plan is designed to strengthen and proclaim the core values of Rotary: service, fellowship, diversity, integrity, and leadership," Kenny said. The training sessions for incoming governors during the weeklong assembly are all tied to some component of the strategic plan, and a final group discussion on Saturday will seek to tie all the pieces together and show the future district leaders how to take the strategic plan to the club level. Kenny concluded his remarks by sharing a favorite saying from his homeland, Scotland: "We must look beyond our own parish pump." "It means that we must look beyond our own home and our own community," Kenny said. "We must look beyond our own needs, and we must be aware that ours is only one community, of one country, of the many communities and countries in this world."